How important are a filmmaker’s original intentions to the way we receive a particular film? This is not a trick question. Filmmaking, like any artistic practice, is a hugely complex undertaking involving many levels of conscious and unconscious activity. Of course, any creator has particular ideas to express and the finished work is the means they have found to express them. But no viewer has direct access to all the decisions and processes that went into the film; all we have is the completed object, and each of us brings to that object our own baggage, viewing it through our own subjective perceptions. 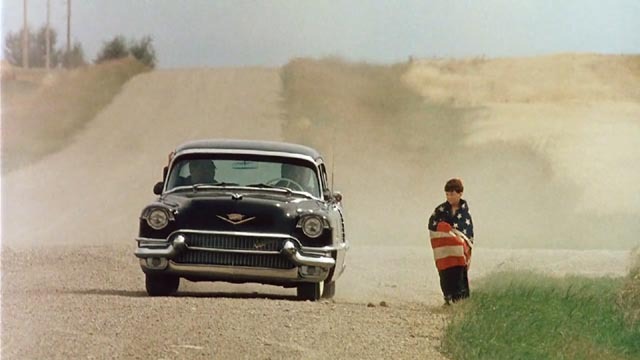 I bring this up because I have just watched Philip Ridley’s first feature, The Reflecting Skin (1990), in a spectacularly restored form on a Blu-ray from Soda Pictures in England. This film has been largely unavailable for the quarter century since its original brief release, a rarity which has served to inspire a cult which has mostly heard about it but never had an opportunity to see it. I did see it once, somewhere back in the mid- or late-’90s, on a lousy pan-and-scanned VHS tape. I can recall being vaguely disappointed because I was expecting a full-blown vampire tale set in what for me was a very familiar prairie landscape. At the time, the film seemed vague and frustratingly elusive. Of course, in the two decades since then I’ve no doubt changed. I’d like to think that my tastes have become more refined and my sensitivity to nuance and allusion has improved. But perhaps it’s mostly this new access to the film’s rich imagery which makes me see it differently this time. But still, how I see it turns out not to be how Ridley intended it, according to the copious supplements on the disk. The film I have just watched is not exactly the film he felt he was making … but does that make me wrong? Ought I to revise my impressions to coincide with his intentions? Or is it legitimate for me to “own” the film in my own particular way, regardless of those intentions? Philip Ridley is an interesting figure. In almost thirty years, he has made only five films – two shorts and three features. Although born in London, his first two features were set in a mythical America of somewhat indeterminate period, the first on the open prairie, the second in deep forest. His third feature was set in a contemporary but just as mythical London. If ever a filmmaker had the credentials to be a cult figure, Ridley is it. His few films are strange, determinedly counter to defined genres and commercial imperatives. It’s not too surprising that he has seldom found financing for their production, putting much of his creative energy over the past three decades into plays and novels. After making a pair of idiosyncratic short films – Visiting Mr. Beak (1987) and The Universe of Dermot Finn (1988) – Ridley was commissioned to write the script for Peter Medak’s The Krays (1990). 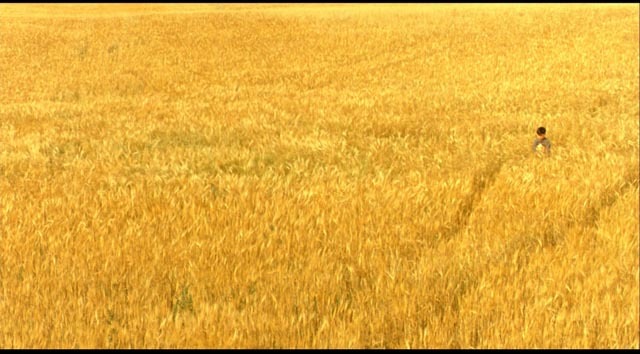 This was enough to secure funding for The Reflecting Skin, a coming-of-age story set among rolling wheat fields in the same kind of dreamlike ’50s that David Lynch evoked in Blue Velvet. Like Lynch’s film, Ridley’s conjures a nightmarish darkness which runs beneath an idyllic surface. There are elements of nostalgia and horror, of family trauma inflicting lasting damage on a young boy, of deep pain and dark humour. The film exists on the border between a lyrical naturalism and symbolic fantasy, a kind of magical realism whose source arises from that young boy’s attempts to create a narrative which explains the troubling world in which he lives. The two subsequent features – The Passion of Darkly Noon (1995) and Heartless (2009) – likewise present distorted, subjective interpretations of a world in which emotions can be overwhelming. While Heartless (for me) ends on an unsatisfying note, with Ridley explaining away as his protagonist’s delusions too much of what he has shown us, ultimately deflating the powerful supernatural implications of the preceding narrative, The Reflecting Skin remains mysterious and suggestive to the end. 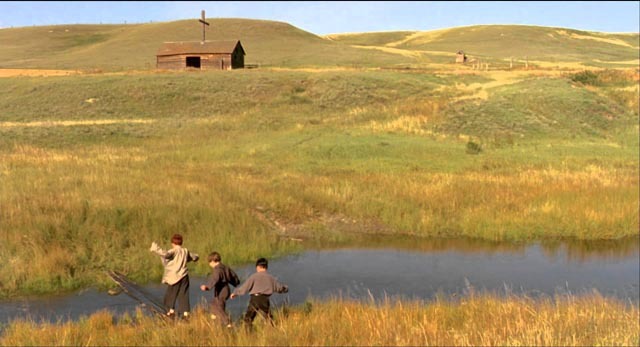 The restored image on the Blu-ray, supervised by Ridley (initially available exclusively in a limited edition steelbook from on-line retailer Zavvi in the UK, but now given a general release by Soda), is spectacular, the wide skies and rich colours of the landscape evoking powerful memories of long, languid childhood days. But despite the sunlight, the film’s underlying darkness becomes apparent in the very first moments, with 9-year-old Seth Dove (Jeremy Cooper) and his two friends committing an act of shocking cruelty involving a gigantic frog and Dolphin Blue (Lindsay Duncan), the strangely ethereal widow who lives nearby. There’s a suggestion of deep psychological damage about Seth, a boy with a cold, impassive stare which hints at a lack of emotional connection. The roots of this become clearer when we meet his parents – a silent, detached father (Duncan Fraser) and a mother (Sheila Moore) whose grip on sanity is visibly slipping. The one anchor in Seth’s life seems to be his absent older brother, Cameron. Forced by his mother to go and apologize to Dolphin Blue for that first cruel act, Seth finds himself confronted by an adult mystery, a revelation of emotional turmoil which he responds to not with empathy, but rather by interpreting the widow’s pain and grief (her husband committed suicide soon after bringing her to this isolated place) by perceiving her as a monster. Her paleness and her seeming discomfort with sunlight combine with his father’s trashy reading to convince Seth that she must be a vampire. 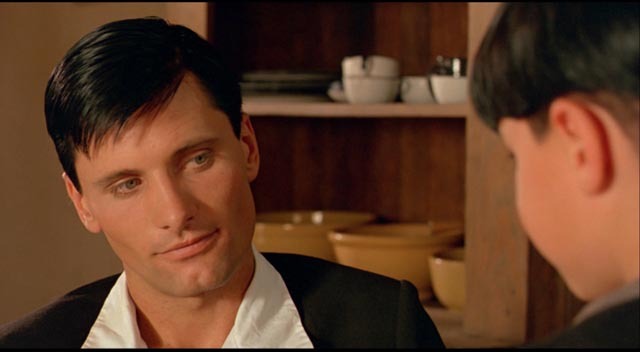 When Cameron (Viggo Mortensen) returns after serving in the Pacific, where he was a close witness to the destruction of whole islands by nuclear tests, Seth is tormented by the obvious connection Cameron makes with Dolphin. These two damaged people cling to each other, with Cameron seeming to grow weaker and sicker, confirming for Seth that Dolphin is a monster draining away his brother’s life. Parallel with this narrative is another horrific thread involving the disappearance and murder of Seth’s friends, killings which draw attention to his family because of something his father did many years earlier, an open secret in the local community which is cause for his father’s withdrawal and his mother’s madness, guilt and shame eclipsing everything else in their lives. When his father commits suicide in front of him, Seth’s response is chilling, an escalation of his development as a possible psychotic. 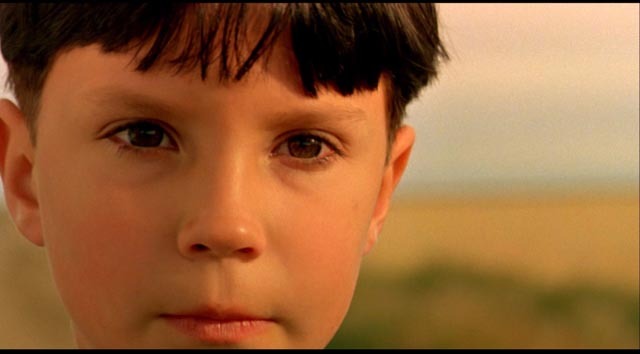 In a way, the film almost suggests that the boy has the power to summon up death. He alone seems to be able to see the sleek black Cadillac which prowls the backroads, its four leather-clad occupants preying on the boys and promising that Seth’s time may eventually come. But Seth’s own attraction to death creates a kind of alliance and, in his desire to save Cameron from Dolphin, he brings her together with the Cadillac. It’s only in the film’s final moments, when he witnesses the pain and horror of Cameron’s loss that Seth seems at last to realize the implications and consequences of his own actions, his despair paradoxically suggesting the tentative possibility that he may yet escape his own encroaching madness. The film’s strength, and no doubt the cause of its commercial difficulties, is its willingness not to explain, to let its mysteries remain unresolved (unlike Heartless). What we see is a child’s-eye view of a world where pain, fear and death are inexplicable forces, a world in which the child uses magical thinking in an attempt to gain some kind of control. So it’s interesting to listen to Ridley’s lively commentary on the Blu-ray, in which he does explain much – that is, he lays out rational reasons for the film’s events which he had in mind as he made it, giving logical shape to the narrative and visual details. But for a viewer (at least to this one), many of these explanations are really not apparent in the film itself. For Ridley, the film is an expression of a now-grown Seth’s memories of tragic events in his childhood, which he tries to make sense of by turning them into this particular story. The fact that these explanations aren’t apparent allows the film to remain in that disturbing subjective borderland between dream and reality. You’d think that it would be more likely that a younger, less “mature” artist would feel the need to clarify and explain, but The Reflecting Skin is at ease with its ambiguity in a way that Heartless isn’t. Ridley’s explanations make sense, but they stand outside the film itself; while they no doubt enabled him to shape the film into what it is, the viewer doesn’t need them to make sense of it. Without such explanations, the film resides in that wonderful space between the physical reality being photographed and the dream-like plane which we enter when we give ourselves to the experience of watching images in the dark. Too much analysis and explanation brings our imaginations crashing back to earth. The film is visually assured, every image richly expressive. Although much of it was shot on actual locations (including the houses where Seth and Dolphin live), the art direction is loaded with suggestive details – particularly Dolphin’s house with all its maritime paraphernalia, including whaling equipment. The cast is uniformly excellent, not just Mortensen, still early in his career, but also Lindsay Duncan, primarily a television actress, here giving a performance quite terrifying in its raw emotional power; Duncan Fraser and Sheila Moore as the parents provide a chilling context for Seth’s psychotic absence of affect, while Jeremy Cooper, in his first role, manages to hold the film together with his disturbingly cold, watchful manner, becoming the monster even as he projects monstrousness onto those around him. Soda’s Blu-ray is superbly produced, with a beautifully restored image and a strong soundtrack which is subtle in its uses of ambiance, while Nick Bicât’s evocative score gives the film a sense of scale. There are a number of excellent extras, including Ridley’s commentary track, a 44-minute documentary about the making of The Reflecting Skin, plus Ridley’s two short films, which both share the feature’s strong magic realist approach to their characters’ emotions and perceptions. There’s also an isolated score track, a trailer and galleries of stills and poster art. This is destined to be one of my top disks of the year, and I’m grateful to my friend Curtis for forwarding me a link to Sight and Sound’s list of best disks of 2015, where it was brought to my attention as one of Philip Kemp’s choices. This entry was posted in Commentary, Review and tagged Blu-Ray, Directors, Horror, Restored Films. Bookmark the permalink.